These two articles use the magical world of Harry Potter to teach the laws of economics. Even though J.K Rowling placed her characters in a world of magic, wizards remain subject to the implications of scarcity. As a result, the series is abundant with examples of basic economic principles. Given the popularity of the series, its use in the classroom is likely to inspire students to adopt the economic way of thinking for life. Deyo and Podemska-Mikluch (2014) demonstrate the pedagogical potential of the series by providing illustrations of trade-offs and opportunity costs, marginal thinking, the power of incentives, and the benefits of trade and commerce. Podemska-Mikluch, Deyo, and Mitchell (2016) uses the series to explain and illustrate the pubic choice school of thought. Podemska-Mikluch, Marta, Darwyyn Deyo and David T. Mitchell. “Public Choice Lessons from the Wizarding World of Harry Potter.” The Journal of Private Enterprise. 2016. 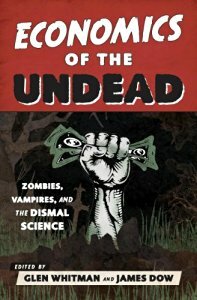 Whether preparing us for economic recovery after the zombie apocalypse, analyzing vampire investment strategies, or illuminating the market forces that affect vampire-human romances, Economics of the Undead: Zombies, Vampires, and the Dismal Science gives both seasoned economists and layman readers something to sink their teeth into. ​Deyo, Darwyyn and David Mitchell. 2014. Trading with the Undead: A Study in Specialization and Comparative Advantage. In Economics of the Undead, ed. Glen Whitman and Dow James. In this special issue on "Economics and the Novel", Deyo (Forthcoming) highlights the economic way of thinking in Jane Austen's novels and the similarities in thought between Jane Austen and Adam Smith's An Inquiry into the Nature and Causes of the Wealth of Nations​ and The Theory of Moral Sentiments. The article is an introduction to recognizing the economic way of thinking in literature and argues that Austen's novels hold relevance in the history of economic thought during the Enlightenment period. Deyo, Darwyyn. “Jane Austen and the Economic Way of Thinking,” International Journal of Pluralism and Economics Education. Special Issue: Economics and the Novel. Forthcoming.